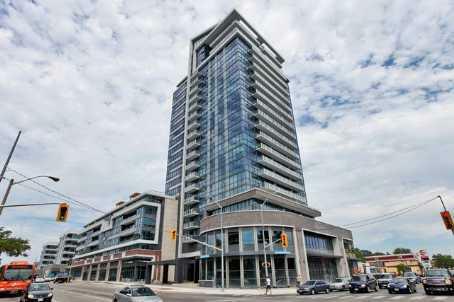 North Shore condominium is located in Mississauga Port Credit neighbourhood at 1 Hurontario Street.. North Shore is a new vision of luxury condo living. A worthy complement and next phase of the award winning Port Credit Village community, North Shore offers elegant waterfront living in a well-established village setting, where the amenities are all within easy walking distance. Rising 22 storeys above Lakeshore Road, North Shore's dramatic architecture makes it Mississauga's finest waterfront landmark. Every facet of its design has been carefully planned with an eye to beauty, as well as practicality. Combining a pleasing palette of glass, concrete and brick, the exterior is crowned by a distinctive rooftop treatment. Two contemporary lobbies usher residents inside with style, and the array of building amenities range from exclusive recreation areas to ground-level shops and services. Mississauga has its share of fine communities to choose from, but none offers the tradition, exclusivity and ambience like that of Port Credit. It's a place you have to experience first-hand in order to appreciate everything it offers. The pace of life here is vibrant and upbeat, yet relaxed and friendly. No matter where you live, you're just minutes from the lake, the shopping, the waterfront parks and the lively marinas. The main street has been beautifully landscaped and features great places to eat, shop, meet people and just have fun. Each charming storefront is an invitation to browse inside and discover something new. The old village character of small stores is nicely balanced by the community's newer stores and services. Dining experiences range from fine to casual. With more than 350 shops located within easy walking distance, Port Credit offers a cornucopia of shopping experiences, from timeless antique shops to trendy fashion boutiques and more. Port Credit Village is a jewel that offers the best of both worlds - the charm of a close-knit "village" community with the convenience of big city amenities, just 20 minutes away from Toronto by local GO transit. It's an anomaly of urbanity that continues to get better with each and every day. Northshore Suites: This condominium offers one and two bedroom suites. the largest two bedroom, three washroom suites are over 2200 sq.ft in size with over 500 sq.ft terrace ! Condo fees include water,heat,building insurace,common elements,central air condition,maintenenace of common elements. Hydro is extra. The North Lobby is a haven of comfort with soft padded chairs and luxurious carpeting surrounding the fireplace. This lobby features a drive-in and drop-off area where you are greeted by a 24-hour concierge. A recessed frosted glass partition can be pulled to section off the private Leisure Lounge, ideal for your intimate gatherings. Play the perfect host in the elegant Dining Room, complete with executive table setting and chef's kitchen. The South Lobby also has its own relaxing lounge area featuring a convenient pedestrian entry and exit to the bustling street corner. Both lobbies have their own luxuriously appointed elevators. Work off those pounds in the state-of-the-art Fitness Centre with its line of sleek exercise machines. Relax in the lushly landscaped Courtyard - as much a feast for the eyes as for the soul. The beautifully appointed Party Room is the perfect venue to spend quality time with friends and family. And when you need a tranquil moment, make your way to the sixth-floor Rooftop Garden, a serene retreat for mind, body and spirit. At North Shore, it's all about luxury leisure living.